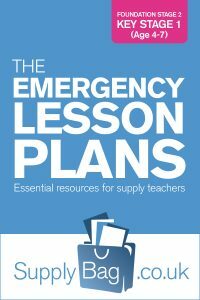 These emergency lesson plans for Reception Class numeracy are only to be used by supply teachers who are faced with no planning or easily accessible resources. Give students a number and ask them what is 2 more/less than it. Investigate which numbers can be halved using items to help. Doubling – use objects to find out what the double of a number is. Add and subtract objects from the classroom. Identify coins and discuss shape, colour and size of them. Use a clock to talk about time – hours, yesterday, today, tomorrow. Students to make their own clocks. Students to draw a timeline of their daily activities and label with time and activity. Use three different colour tiles to create patterns. Look for patterns in the classroom. Organise objects into weights – heaviest to lightest.